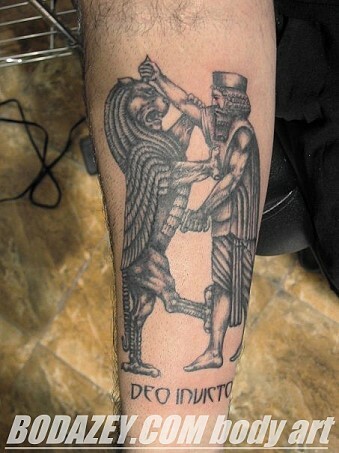 Even more Persian Tattoos | Ketuvim: the Writings of James R. Getz Jr.
As a follow up to yesterday’s post on the tattoo of Ahura Mazda, Chuck Jones tweeted me this post of more Persian tattoos. My favorite is the one to the left, obviously inspired by the Assyrian hunt motif that is sported on the State Archives of Assyria seal. If I were and Assyriologist, I’d consider getting this piece. Nothing like showing your allegiance to the forces of order and culture over those of chaos, ignorance and discord. But as it is, I’m a Northwest Semiticist; and we all know of the aniconic trend in that art….